Posted August 13, 2015 by Lydia Watson Moore & filed under City News. Cyclists came out in force to lobby NSW MPs returning to state parliament this week. 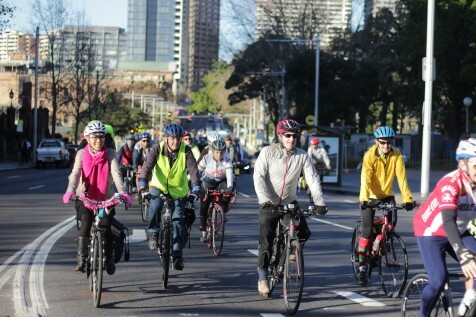 More than 100 riders took to the partially demolished College Street cycleway on Tuesday morning and rode to Macquarie St, in an attempt catch the attention of politicians. Spokesperson for the Save College Street Cycleway lobby group Rob Berry said that the ride was an attempt to send a message about the cycleway destruction. “We’ve decided to use this opportunity to ride to Parliament House to take our message to the politicians, who’ve up until this point have mostly been ignoring our attempts to communicate with them,” Mr Berry said. Mr Berry told City Hub that while there had been some support from all sides of parliament, the government had not listened to the cyclists’ protests. “The lack of a cycleway is not going to make the cyclists disappear, it’s just going to push us out into sharing road space with buses and cars,” he said. The demolition of the College Street cycleway is part of the construction of the CBD light rail. Mr Berry told City Hub that the NSW government had backflipped on its promise, as the College Street path was not originally scheduled for removal until Castlereagh and Liverpool Street cycleways were completed. However, these two new cycleways are significantly shorter than original plans, and local cyclist John Caley said these proposed alternatives are not feasible. “They’re a long way away, people coming from , Oxford Street aren’t going to do that,” he said. Mr Berry also said he thought the new cycleways would not be sufficient for the demand. “It’s great that we have some new cycleways getting built, but unfortunately both of those in their implementation are pretty lacking compared to what the original vision was,” he said. Speaking at the rally, Greens Transport spokesperson Dr Mehreen Faruqi said the riders displayed the potential repercussions of the cycleway’s removal. “Today’s action…showed the government what Sydney looks like without cycleways: congested and a headache for cyclists and motorists alike,” she said. The Save College Street Cycleway group has been riding every Friday morning for the last few weeks down College St in protest to its demolition. Mr Berry said the group was riding out on the road to show what “the consequences of the policy” will be to motorists. found that about 50 per cent of people are still intending to ride down College Street, because that’s the way they need to go to get to work,” he said. Mr Berry said the cycleway would be fully demolished in about a month’s time, and expressed disappointment that politicians again chose to ignore their pleas at Parliament House on Tuesday. He said that they would continue to ride each week in protest until the removal, and following that, the cyclists would organise a daily group ride to ensure safety. “Once the demolition starts we will be organising a ‘bike bus’ which will ride everyday from Taylor Square into the city so that people who do need to still use that route can ride with other people and we’ll have our safety in numbers,” he said.